Miranda Hennessy: QUACKS starts on BBC Two 15th August at 10pm! UK Agent: Debi Allen @ Curtis Brown. QUACKS starts on BBC Two 15th August at 10pm! Quacks follows the progress of four young medical pioneers in the daring and wild days of Victorian Medicine. 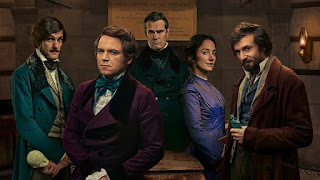 Stars Rory Kinnear, Rupert Everett, Matthew Baynton and Caroline Lessing. Miranda Hennessy plays Nicola Bell; daughter of the Apothecary.